One of the most sought after of all of the Fritillaria species is Fritillaria Imperialis. It is not commonly found in cultivation in Australia as it is slow to grow from seed, taking 7 – 9 years to flower. It is however available in flowering sized bulbs from selected specialist growers. 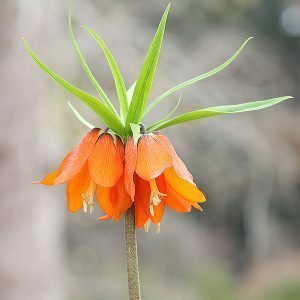 In full flower, Fritillaria Imperialis presents us with a cluster of red to orange bell shaped flowers, crowned with a tuft of glossy green foliage. Very young bulbs may present with only one flower, more mature bulbs up to 8 individual flowers. The trick to growing these bulbs successfully is drainage. The bulbs produce a strong flower stalk, when this dies back, a hole is left in the middle. This allows rot to easily set in. Full sun to a little afternoon shade is best. We fertilise with some blood and bone, along with some pelletised seaweed and fish fertiliser. We plant ours bulbs in containers, 10cm of free draining potting mix, 3 cm of blue metal gravel and then the bulb, laid on its side, directly on the gravel. The bulb is then covered with another 10 cms of potting mix. Once the plant has died back in early summer, we remove the pot to a cool shaded position and cover it to make sure it receives a dry summer and autumn. Into mid winter we remove the cover, checking to ensure that the soil does not get to wet. In periods of heavy rain, we sometimes bring the pots under cover. We do repot the bulbs every third year. We also grow them in the ground, similar soil preparation in a position on a slight slope. This seems to work well for us. You can grow F. Imperialis from seed, however it does need to be fresh. Over time the bulbs will also form offsets, an easier method. Difficult to find, limited quantities are available in autumn. Bulbs are available for sale from the following participating Nurseries.